Mr Marshall, who originally owned a music shop in London, founded Marshall Amplification 50 years ago. He had suffered several strokes in recent years, and developed cancer at the end of 2011, his son said. A statement posted on the company's website called him a "legendary man" who led a "truly remarkable life". Jimi Hendrix and Kurt Cobain are among the musicians who used Marshall amps. 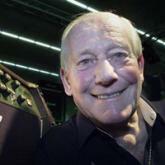 Former Guns N' Roses guitarist Slash tweeted: "The news of Jim Marshall passing is deeply saddening. R & R will never be the same w/out him. But, his amps will live on FOREVER!" Motley Crue bass player Nikki Sixx also paid tribute on Twitter, saying Marshall was "responsible for some of the greatest audio moments in music's history - and 50% responsible of all our hearing loss." Speaking to Radio Four's Front Row programme on Thursday, musician Paul Weller said he used a Marshall amp that was "at least 40 years old and still sounds fantastic". "For me it's the exactly right amp for the job," said the former Jam and Style Council frontman. "I don't know if anyone's particularly improved on it, to be honest." Jim Marshall began building amplifiers in the early 1960s, using the Fender Bassman amp as a model, creating what later became known as "the Marshall sound". After talking to Pete Townshend and Ritchie Blackmore, who were customers at the shop, he realised there was a gap in the market to make a cheaper alternative to the other models available at the time. It took him six attempts to create an amp he was happy with. As the company grew, Mr Marshall expanded his product range, unveiling the Master Volume Marshall amps and the classic JCM800 split channel amps. "Jim rose to become one of the forefathers responsible for creating the tools that allowed rock guitar, as we know and love it today, to be born," the statement said. "In addition to the creation of the amps, chosen by countless guitar heroes and game changing bands, Jim was also an incredibly humble and generous man who, over the past several decades, has quietly donated many millions of pounds to worthy causes." Marshall amplifiers were such a fixture of the rock scene that they featured prominently in the spoof documentary This is Spinal Tap. In a famous scene from the film, guitarist Nigel Tufnel proudly showed off his Marshall stack which went up to 11. He explained it was "one louder" than usual amplifiers. In 2003, Marshall he was given the OBE for his services to music and charity. He was a regular supporter of Macmillan and the Willen Hospice. He also donated money to the Royal National Orthopaedic Hospital in Stanmore, where he was treated for tuberculosis as a child. The Marshall Amps company, which is now based in Bletchley, Milton Keynes, is celebrating its 50th anniversary with a tribute concert at Wembley Arena. Iron Maiden, Slipknot, Whitesnake and The Cult are among the bands who have been lined up to play at the September event. Mr Marshall will be remembered alongside guitarmakers Leo Fender and Les Paul for shaping the sound of the modern electric guitar. He is survived by his children Terry and Victoria and step-children Paul and Dawn.